A lot of building is currently taking place in Ghent’s historic city centre. However, the related heavy traffic causes problems, such as noise and air pollution, stench and other health risks. 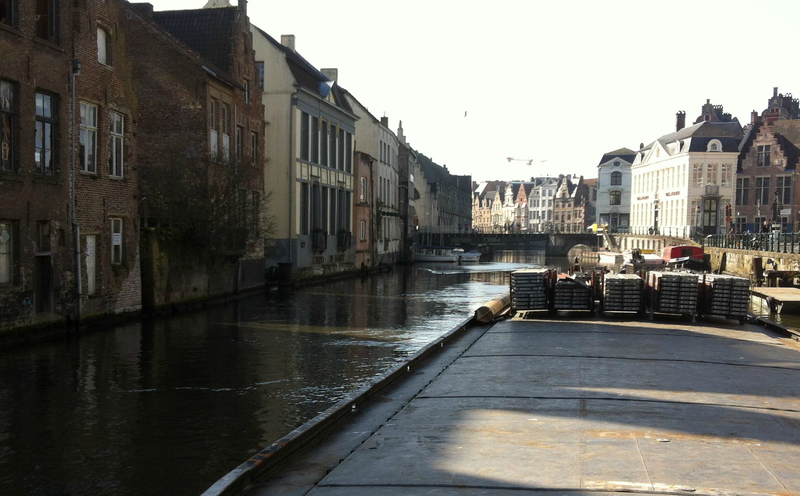 The Flanders Institute of Mobility (VIM), an independent organisation commissioned by the Flanders Government to implement sustainable mobility solutions, tested an initiative that would transport building materials to an inner-city construction site using Ghent’s narrow waterway network. The pilot precedes the implementation of a regional network of distribution and consolidation centres for the construction sector, with waterways being used as the main form of transport. Implementation is expected in 2016. Ghent is a medium-sized Belgian city with around 257 000 inhabitants. Lately is has seen a lot of construction work as its older, historic buildings are refurbished or demolished to make room for new, modern developments. This has had a massive impact on inner-city mobility. Increased traffic from heavy goods vehicles (HGVs) and light commercial vehicles (LCVs) increases pollution and noise levels, and poses traffic safety issues. Currently Ghent has moderate-to-bad air quality 30 per cent of the time every day; 32 per cent of the pollutant emissions are caused by transport. Over 15 per cent of residents are exposed to noise levels of 70 dB (A) or more and public space is increasingly occupied by parked utility vehicles and dumpsters. The construction site where the VIM last-mile initiative was tested is located in a pedestrian shopping area, the Langemunt, which has access and space restrictions as it has been closed to traffic since 1982. The Langemunt pilot project is part of the larger Distribuild project, which aims to develop a network of multimodal distribution and consolidation centres in Flanders and Brussels. These centres will take and process deliveries of construction materials before sending them on their last-mile journeys using sustainable modes of transport. The project uses a special flat type of vessel (a push barge/pusher combination). These vessels were modified to cope with the inner cities’ water network’s limitations. By partly demolishing the wheelhouse and lowering the on-board hydraulic crane, the vessels were able to pass underneath low bridges. Besides modifications to the vessels, reducing the water level also played a role, solving the problems posed by the height of the vessel. This barge ferried between the construction site, adjacent to the river Leie, and a consolidation centre, located outside the city centre and connected to the main road network. This set-up allowed part-loads of construction materials to be consolidated and shipped to the final destination instead of requiring numerous HGV deliveries into the city centre. The push barge also allowed for the removal of up to 60t of debris per shipment. As a bonus, the push barge, when not in action, acted as a temporary on-site storage and processing area, facilitating the construction work as the building site had a space shortage. The use of a consolidation centre showed that a number of logistic activities related to an inner-city construction site can be performed off-site. This removes from the site time-consuming and other auxiliary tasks that require extra space. The project ran from March to July 2014 and the total costs were € 43 600. However, VIM calculates that this can be reduced by 60 per cent to around € 26 600 as a lot of the costs are initial. A cost benefit analysis shows that the benefits outweigh the costs: the total benefits are € 5 625, or about € 75 per roundtrip. The project demonstrated successfully that even small boats or ships can be used to replace HGVs for the transport of construction materials to and from inner-city construction sites. For 2016 the regional implementation of a network of distribution and consolidation centres for the construction sector is planned. Transport of construction materials between the centres and building sites will take place using waterways. This type of transport can easily be replicated in replicated in other European cities which have inner-city water networks. However, VIM did face some initial hurdles. In addition, the project demonstrated the benefit of a consolidation centre for construction materials on the edge of town. Such a centre can act as a support site for inner-city construction sites, by consolidating part-loads into single-load deliveries or by performing value-added services such as pre-fabrication works, sorting, unpacking or recycling. This type of activity can be replicated in any mid-size or large European city.